My work is figurative and autobiographical. It deals with my personal thoughts and feelings, much of which is subconscious. I usually don't know what my pictures are about until they are finished. I like to work in various media, including painting. I have a passion for drawing and printmaking. Sometimes I have a need to work in a three dimensional way. This accelerates the development of my work. Foreign travel and different cultures always inspire new ideas - it always amazes me what eventually comes out in my work after being exposed to external influences. June says, "I am hoping that the 'One Day' exhibition can be seen to mirror/ highlight, the 'One Day' we will have as a Nation, to make a change for independence." 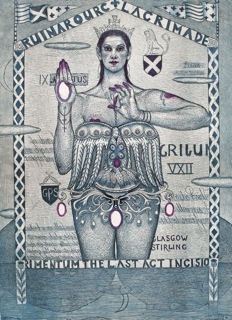 "Dies Anniversarius", hand-coloured etching, 35 x 45cm.